With theretirement of NASA's space shuttles on the horizon, a special WhiteHouse-appointed task force has launched a new interactive website to seek inputfrom Florida's Space Coast workers most affected by the looming course changesin America's space program. The site,created by the Task Force on Space Industry Workforce and Economic Development,offers information about the efforts by President Barack Obama's administrationto create new jobs in the region to supplant those being lost throughthe retiring shuttle program. "Weconsider the new interactive website an important tool to understand public concernsand challenges about the economic growth and well being of Florida's SpaceCoast," Woodrow Whitlow, NASA's associate administrator for the MissionSupport Directorate in Washington, D.C., said in a statement. "Thistool and our other outreach efforts will help the task force preparerecommendations for the president that reflects the greatest needs and concernsof both the public and the area's aerospace-related industries," he added. The new direction for NASA, as proposed by President Obama, wasannounced in February as part of the administration's 2011 budget request.Under the plan, NASA would cancel the existing Constellation program, whichaimed to build Ares I and Ares V rockets to carry astronauts aboard aspacecraft called Orion back to the moon. Instead ofConstellation, President Obama is calling for NASA to send humans to anasteroid by 2025, and then push on to Mars by the mid-2030s. ThePresident also proposed extending the International Space Station, which wasset to be decommissioned in 2016, through 2020. To carryastronauts to the station after the space shuttles are retired at the end of2010 or beginning of 2011, the new proposal would rely on Russian Soyuzspacecraft and new private U.S. spaceships yet to be built. Meanwhile, NASAwould focus its energies on designing a heavy-lift rocket capable of travelingbeyond low-Earth orbit to destinations including an asteroid and Mars. 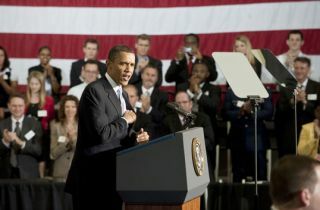 The Florida taskforce was established May 3, after President Obama issued a presidentialmemorandum. NASA Administrator Charles Bolden and Secretary of Commerce Gary Lockeare co-chairing the effort. The taskforce's mission is to develop an interagency strategic action plan to enhanceeconomic development along Florida's Space Coast and related areas. Plans willinclude recommendations to ensure the region is equipped to adapt to changes inlocal economies resulting from developments in America's space program. Among these recommendations will be a strategic investment plan for $40 millionin new federal funding for the Space Coast region that the president includedin his 2011 budget request. "PresidentObama is committed to helping Florida's Space Coast adapt and thrive in theyears ahead," said John Fernandez, U.S. Assistant Secretary of Commercefor Economic Development. "The work of the task force adds to thisadministration's unprecedented level of transparency, and ensures public trust,participation and confidence. Our efforts depend on the participation of localstakeholders who will ultimately devise and implement a bottom-up, regionallydriven strategic plan." The task force will review all input, and members of the public are invited to comment. The website can be accessed here . The task force will present the plan to the president by Aug. 15.